Balloon twisting is no easy job. It is a creative art form which requires not only mastery over the craft but also imagination and creativity that will transform a simple balloon to the most unique and exquisite of shapes and figures. Talented and master Balloon twisters Melbourne can mold the balloon into any shapes and objects under the sun. 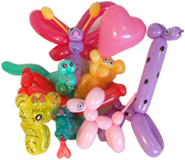 Use high-quality balloons that can be easily twisted and molded into various shapes and figures. There are special balloons available especially for balloon twisting. Try using hand pumps for inflating the balloons, unless you want to impress the kids with your lung’s balloon inflating prowess. Always leave a little space at the tail end this will uniformly relieve the pressure resulting from continuous twisting. Balloonatic Bruce is one of the most prominent Balloon twisters Melbourne. He is master in his craft of balloon twisting and is likable to children and parents alike.